From a factory rooftop, Iver and his good friend Ellsworth (a rooftop bear) are content to watch the busy world below. “Everyone’s going somewhere,” Iver says. “We can see the whole world from up here. That’s enough somewhere for me.” But after Iver retires, the friends must venture out in search of a new somewhere. Of course, the very best views are those you share with an old pal. Casey W. Robinson grew up in Maine and now lives with her family in Massachusetts. She occasionally drives past a rooftop bear in the nearby city of Worcester. She writes stories for children, but they aren't always about children. 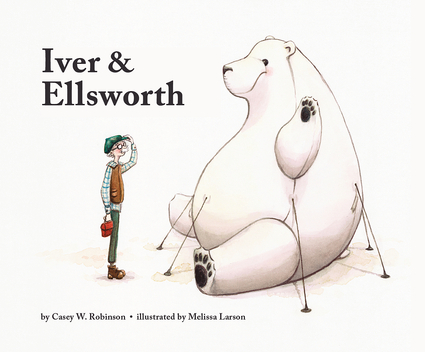 Iver & Ellsworth is her first picture book. Visit her website: CaseyWRobinson.com. Melissa Larson attended Azusa Pacific University for a BFA in art and a minor in writing. Right now she is likely off to a new somewhere (she can't sit on the same rooftop very long). She prefers peanut butter and jelly on her whole wheat. This is her first picture book. Visit her website: MelissaLeannLarson.com.